It is a very specific and precise way of obtaining an image that facilitates examination and further treatment in dentistry, plastic surgery, sleep therapy and ORL. Important: this examination has a far lower irradiation dose compared to computer tomography. The device adjusts the smallest optimal dose based on patient age, individual anatomical features and localisation, in order to obtain the highest quality image for faultless diagnosis and further treatment planning. With only one examination panoramic image is obtained where you can see whole upper jaw, lower jaw, teeth, part of sinuses and TMJ. This allows for a precise evaluation of the state of jaw bones and teeth, the prediction of possible inflammations; helps with the planning of treatments, surgeries, teeth reconstruction and prosthetics. In the panoramic mode the device takes 10 different snapshots with one rotation. The software picks the best image and combines clearest, best visibility snapshots to provide for high-quality diagnostics. The examination provides very precise three-dimensional information about the anatomical structure of jaw bones, their strength and possible alterations. This significantly facilitates planning for teeth implants as well as the choice of implants. For example, if a tooth has been missing for some time it is possible the jaw bone has undergone some anatomical alterations and it would be necessary to establish if there is enough space to screw in a new implant. The device’s software also facilitates ORL practice for throat, nose and ear examinations both for children and adults. Because the device allows the virtual examination of every passage, observing even the tiniest details, turning and enlarging images, it allows easy diagnostics of tympanum inflammation, nasal cavity inflammation and other inflammations. The device is well suited to examine uncertain breathing disruptions, for example, shortness of breath, heart palpitations or difficulty to breathe while exercising. It provides quick clarification of the effects of anatomical peculiarities, such as nasal septum shift or nasal cavity inflammation; it can also be used toevaluate the severity of inflammation. This examination is done if a jaw surgery or facial plastic surgery is planned that could potentially change facial features. It is also used before orthodontic treatments, extensive teeth implanting and other surgical or stomatologic manipulations that can change the appearance of a face. 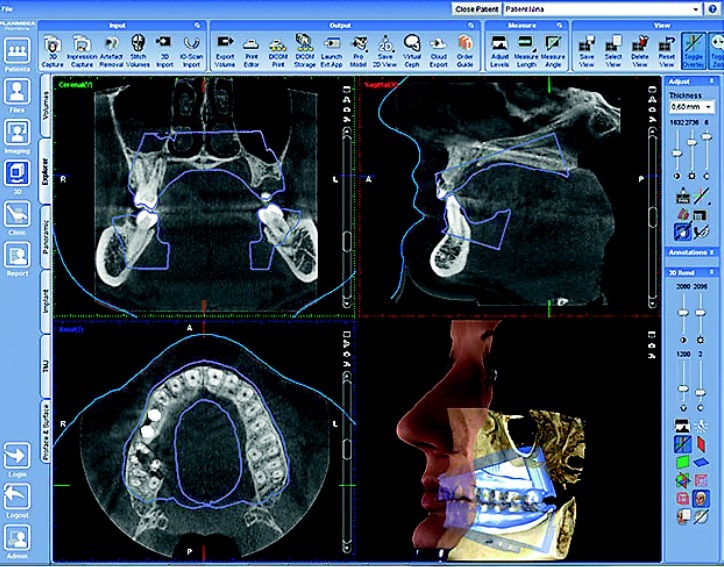 ProFace is a unique 3D snapshot of facial soft tissues, mainly used in jaw surgeries because it provides a great overview of the state of bones and also soft tissue. If during a surgery jaw position is changed, for example when straightening a skewed jaw, snapshots are taken before and after the surgery. This was it is possible to layer both images to see what and how everything has changed. It is also useful for orthodontics, when correcting occlusion it is important to evaluate the outcome, because a patient adapts to the new look very quickly and does not remember how it looked before. 3D scanning of teeth imprints or plaster models. Stomatologists and teeth technicians often chose to use services from teeth-technical laboratories equipped with CAD/CAM systems. To efficiently exchange patient teeth imprint data with distant laboratories, 3D printing or prosthetics and implant component manufacturers it is important to quickly and precisely forward patient’s data for further processing. This unique technology allows access to the important data instantly and allows forwarding the data to the most distant places in the world in a matter of seconds. The device is adjustable to every diagnostic’s necessity, because it can provide exhaustive information overall and do a fine analysis of every detail. Good news: patient will never have to do a repeat X-ray as was often the case before when an image was not of a high enough quality. The X-ray is digital and once the image has been acquired the software allows it to modulate: turn, enlarge, zoom in etc. This type of high level device is the only one in Latvia, with no close-standing devices anywhere else in Latvia. The examination does not cause any discomfort and it lasts for no longer than 20-30 seconds. It is suitable for those who suffer from claustrophobia. Patient receives their data in a CD enabling them to consult with a variety of specialists. Thursdays 1.30 pm – 3 pm. You can book an appointment by calling: + 371 67201007 or + 371 67201008.